So I turned to the dark side and bought a Mac MINI. Its not going to replace my laptop or anything like that, but I have wanted one for a long time, and now that they are using the Intel chips, and also the boot-camp program, just pushed me over the edge, so I bought one. Right now I am updating from my mac and I am loving it. I really just freaking love the Dashboard feature and also I love iChat too. I really need to see if they make a windows version of iChat, cus damn I love it. 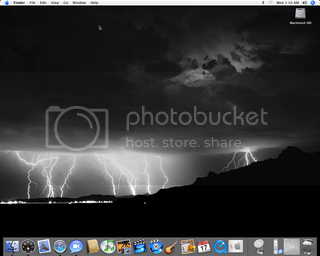 So, using one of the Dashboard widgets I took a snapshot of my screen on my Mac. Also I really do love Mac OS X, and I think if they made it so that it could run out of the box on a Dell or non Mac computer, they really could give Microsoft a run for there money. Its really stable, and I know that as it gets more popular there will start to be attacks against it. But its still sweet. Well, its been a really freaking busy day (that's a whole other post on its own), and I am very tired so I going to hit the hay. If you're willing to turn to the dark side, I think I'm ready too... I looked at Mac laptops yesterday, and I think I'm going to try a Mac for the first time ever when I have the money. I'm so fond of the Mac OS X that I won't be able to help myself. I do not know if I would buy a MAC Laptop cus I still love my Dell and having Windows on it. But, I am toatlly loving MAC OS X and this mac-mini. Also this thing boots in almost no time, which comapred to Windows XP is werid. I am used to hitting power button, and then going to do something for a min or two, but with the mac, it boots in like 10 or 15 seconds. Freaking sweet.